Exciting new Star Wars attractions are coming to Disney theme parks in 2019! We are pretty stoked for Star Wars: Galaxy's Edge but to hold us over until it opens (summer 2019 at Disneyland/fall 2019 at Walt Disney World) we are practicing our Jedi skills at Hollywood Studios. 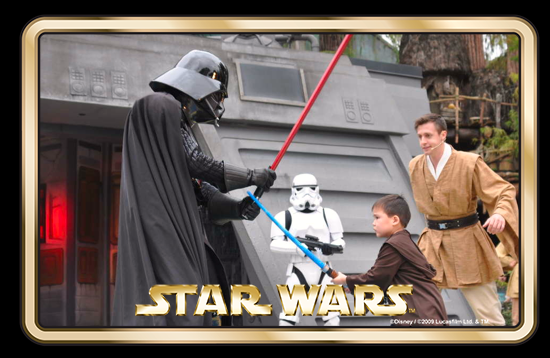 Jedi Training: Trials Of The Temple at Hollywood Studios is one of our favorite attractions at Hollywood Studios. 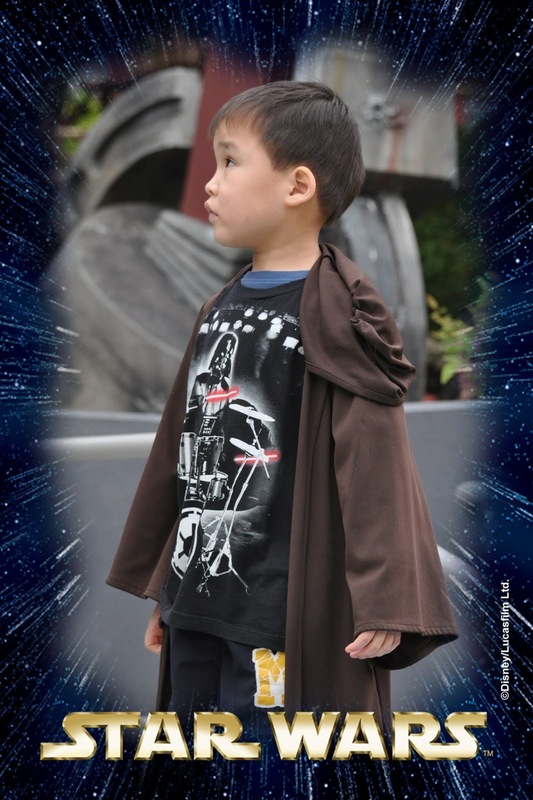 Trust us, if you have a son or daughter between the ages of four and twelve that loves Star Wars, this experience is a must do! On the day of training, you need to be at Hollywood Studios just as the park opens in order to have a shot at getting a spot. You can easily tell who is headed to sign up for training. As soon as the gates open there are tons of kids frantically running in one direction with Moms and Dads trailing behind. After the sprint you will find yourself outside of the Indiana Jones Adventure Outpost. The shows are limited and your child must be present to register so get there early and prepare to spend the day enjoying Hollywood Studios! We loved this quote that used to be on the Disney website "Be sure to register early! The Academy has limited capacity, so it's first come, first sabered." The quote has been replaced by "first come first served" but we's love Disney to jazz it up again. 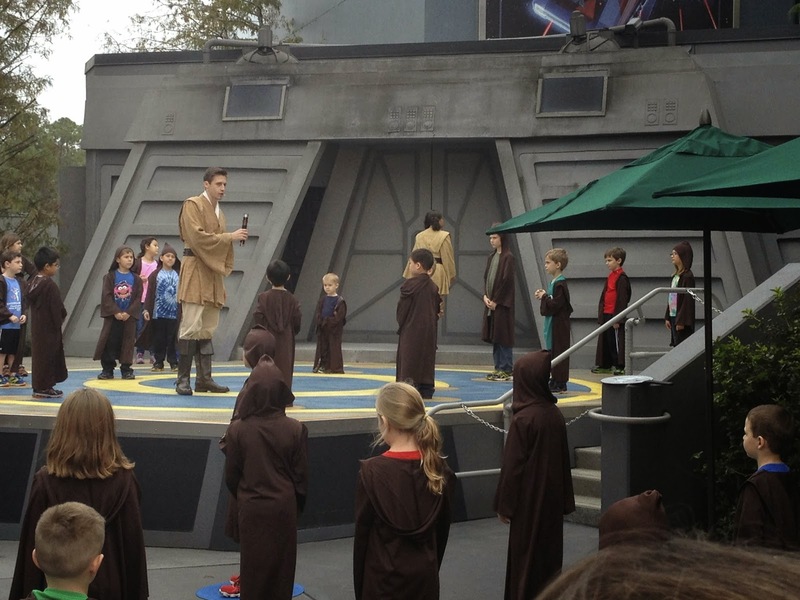 Jedi trainers pick up to 30 potential "Padawans" for each show. If chosen your padawan will be given a time to report back to begin training. Make sure to arrive 30 minutes in advance. Under the instruction of a Jedi Master, your child will be tutored in Jedi trivia, dressed in authentic brown padawan robes and pledge the Jedi Oath. The kids learn how to use the force while wielding their own light saber! Battle skills are taught and Jedi bonding goes into overdrive. At some point a disturbance in the force is sensed! Suddenly there are storm troopers marching in to loud music and the kids need to defend themselves against the Dark Lord and the Seventh Sister Inquisitor! If the kids can defeat these dark villains there is another sinister, dark force to battle. If the padawans defeat all the forces of evil they will each receive their own authentic pin to commemorate their successful training. We went into training not knowing what to expect. After the initial shock of being thrust into battle on stage and with coaxing from the sidelines, my son rallied. If your child is a little timid or scares easily you might want to wait till a future trip to train! Training is outside so times are subject to change depending on weather conditions. Make sure you have a ton of space on your camera card because these are going to be shots you don't want to miss. Wevhighly recommend one person take video while another takes photos. Disney photographers are there so make sure you get the photo pass cards they are handing out. The Disney photos are up close and come out fantastic! If you are traveling with a group, have everyone show up to cheer on the Jedi in training. It is fun for the kids to have a crowd in their corner as they face their fears! There is no shade so spectators should be prepared with hats, sunscreen and water.